Learning how to read historical timelines in Mrs. Kubasiak's Second Grade Class. What an excellent use of visual display to represent learning as students use their own personal histories to create their own historical timelines! Experiential learning taking place in Mrs. Taunt's Soc. St. class! ​Students were engaged in a simulation of The Great Depression! Students had to figure out how to survive from the years 1929-1941. Some had to give their kids to orphanages, some made their own clothes (taped to themselves, some lived in Hoovervilles (those sitting on the floor), and some had to be jailed for failure to pay taxes. Mrs. Hulce's Science Class is working on STEM activities in a maker space! 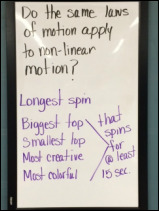 Students are collaborating and critically thinking on demonstrating how force and motion work. Mrs. Hulce took advantage of an opportunity through HotWheels! in securing free race tracks and cars! Putting their 21st Century Learning Skills to use, Mrs. Taunt's World History class recently put Genghis Khan on trial. After lengthy research and investigation utilizing informational literacy, collaboration, and critical thinking skills, everyone had to act out their roles followed by analysis of all roles. Mr. Khan was almost found innocent! As part of the Calhoun County Arts in Education Grant, Mrs. Lijewski's class made Mardi Gras masks. The first set of pictures show beginning Mardi Gras masks construction and how the forms and plaster wrap were used to create the shape of the mask. Shapes and design were inspired by traditional Mardi Gras masks. Feathers, sequins, and rhinestones were added for additional features to enhance the masks. The second set of pictures show a closeup view of each of the students' masks. The bottom picture is of Mrs. Lijewski's Multi-Media Class donning their new masks! The 4 C's of 21st Century skills are Communication, Collaboration, Critical Thinking, and Creativity. ​STEM activities and Project Based Learning is key to how kids learn today! Mrs. Hulce's Science Class is learning about forces and motion! Students shown here are working to create their own tops to see who can create the top that can go the longest. Exploring and researching ideas and topics! Mrs. Swank's class is working on researching and learning about landforms!